With the success of the Vulcania model, HD3 Complciation is once again bringing out its bi-axial tourbillon with the launch of the new and exclusive Black Pearl model. For this new adventure Fabrice Gonet was inspired by the wonderful era of pirates and buccaneers, to which he added the retro-futuristic steampunk style so uniquely characteristic of Vulcania. The design of the Black Pearl watch case is straight out of the world of pirates: there is a hatch on the 9 o’clock side of the case which looks like a cannon hatch of a naval man o’war from former times. It opens to give a panoramic view of the tourbillon from the side, and also reveals a plate on which can be engraved the name of the owner and ‘captain’ of the timepiece. The hatch is decorated with a small plate in titanium PVD showing the famous skull-and-crossbones flag of the pirate Jack Rackham. The sapphire glass back is engraved with a compass rose designed specially for the watch. The design of the crown is reminiscent of a frigate’s tiller. The bi-axial tourbillon at the heart of this timepiece presents a unique display specially developed by Fabrice Gonet. In a salute to the early days of naval exploration, the hours are shown on a wheel, the minutes on a disk and the power reserve indicator takes the form of a sextant. The HD3 Complication Vulcania Bi-Axial wristwatch is quite large, but due to its rectangular case, it is actually quite comfortable and good looking. 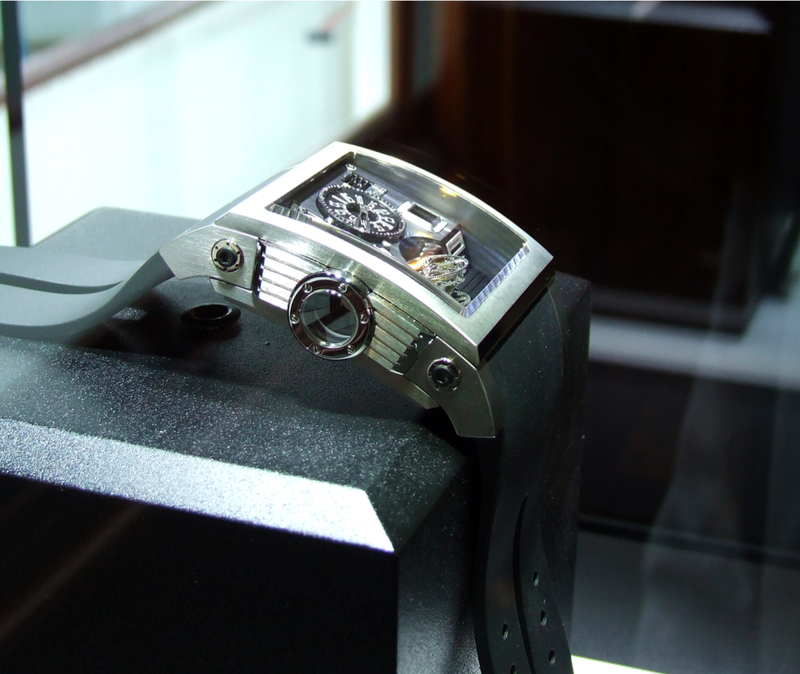 The watch is a bi-axial tourbillon, which rotates in 1 minute increments on the 1st axis and 30 seconds on the 2nd axis. The movement runs a 21,600 vph and has an 80 hour power reserve. The movement was created by BNB Concepts, a company that builds complicated timepieces and movements for some of the industries’ biggest names. The case features a mixture of PVD and stainless steel. The dial features a nice contrasting red on black color scheme. The numerals are painted with red Superluminova. Overall, the watch is very appealing, but with only 11 of them being made worldwide, they will be extremely exclusive and pricey. Each watch comes with three bracelets: 1 rubber, 1 black alligator leather, 1 black vintage leather with red stitching. Video I shot of the HD3 Vulcania back in 2008 (also available on YouTube).